DOD photo by Elaine Sanchez. Can the minds behind Sesame Street sweep the clouds away and create more sunny days for children across America? Fresh off being named a finalist for the MacArthur Foundation’s “100&Change” competition, the nonprofit Sesame Workshop has launched another innovative initiative to “mitigate the harmful effects of adverse childhood experiences,” part of Sesame Street in Communities. The new collection of resources for families could be part of the solution for a dire situation: A new analysis of a 2016 survey of children’s health reported that nearly half of American children have experienced an adverse childhood experience (ACE), such as domestic violence or a natural disaster. The Sesame Street Muppets will model coping strategies for kids and caregivers with bilingual videos, books, and digital activities, from Big Bird learning how to make his nest a safe space to a breathing technique taught by the Count. Sesame Street in Communities is currently being piloted in three cities and through PBS stations nationwide. 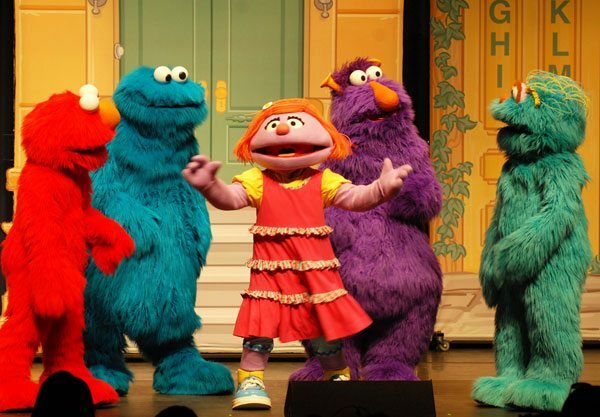 “Over the next five years, Sesame Street in Communities aims to reach 4.5 million children under age 6 and their families; connect with more than 11,000 direct service providers; develop 200 national and local partnerships; and expand to at least 35 additional communities across the country,” the release said. Long a childhood favorite, Sesame Street has since expanded beyond television and Sesame Workshop even announced a partnership and $10 million fund with a venture capital firm last year called Sesame Ventures. Sesame Workshop also received widespread acclaim last year for partnering with the International Rescue Committee (IRC) to reach children living in refugee camps and creating two special new characters—a Muppet named Zari with a headscarf, appearing in the Afghan version of the show, and one named Julie who has an autism disorder. Sesame Seeds will mitigate some of war’s most harmful consequences and empower today’s victims to be tomorrow’s nation builders.